Hi Friends, it's Samantha from Crafty Texas Girls here. Time is flying around my house. Between camps, dancing, swimming, and fun with friends-- we are keeping ourselves pretty busy. Most of my projects this summer have involved my kiddos and creating a cozy home for us to enjoy. From the looks of the party last week, it seems that incorporating family into your creative time is the name of your game too! So with that said, let's take a look your great posts. 1. Create a beautiful gallery wall using meaningful objects. "Art" doesn't have to be limited to photos or paintings. Try using fabric and embroidery hoops like Carolina Country Living did in her craft room. 2. Break out the power tools! From book shelves to benches, you can do it all. Miss Kopy Kat shares a ton of great tips for using power tools to transform your home-- courtesy of the infamous Ana White. 3. Shop in the hardware department. Some of the best home decor can be found where you least expect it. 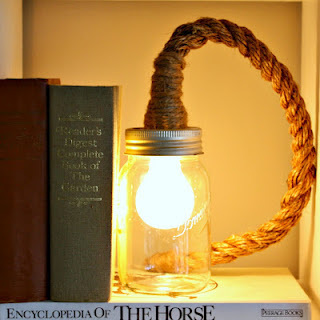 Take for example this mason jar light by Vintage Prairie Style. 4. Don't make it obvious! Check out how Meeha Meeha created a light, airy beach feel without the use of dolphins, star fish, or boats. Themed decor doesn't have to be cheesy. 5. Re-purpose old items. 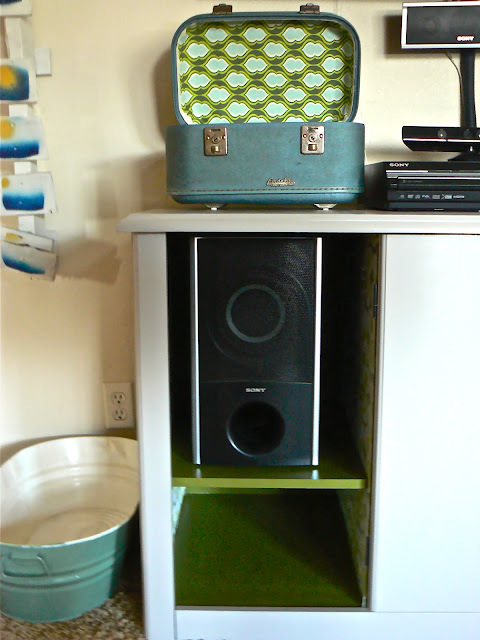 Jed and Ivy used a little TLC and some mod fabric to transform a vintage suitcase into an entertainment center 'catch-all'. 6. When in doubt, paint it. Nothing brings a piece of furniture to life like a fresh coat of paint. 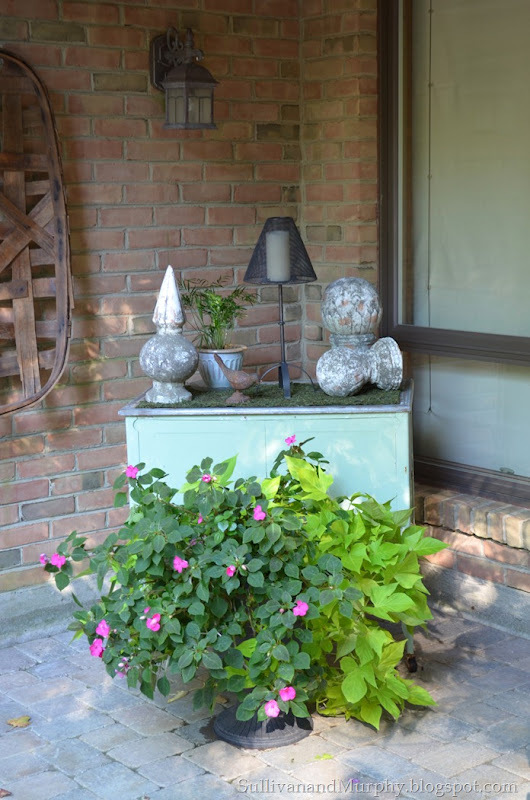 "Bella's Crafty Mom "shows how she brightened up a $9 night stand with the help of a brush. 7. Don't give up. When a piece seems 'beyond repair', think outside of the box. 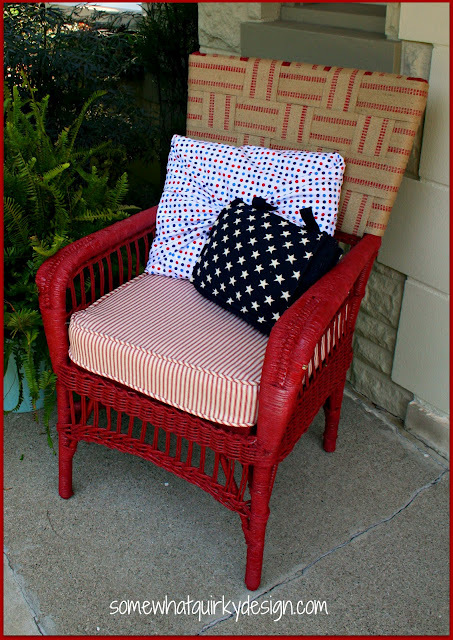 You have to click over to "Somewhat Quirky" to see the 'before' image of this chair! A great example of an amazing transformation. 8. It doesn't have to "match". "The Ironstone Nest" reveals her dining room and shows that furniture does not have to be bought as a 'set'. Often, the most beautiful rooms are full of coordinating furniture that has been collected over time. 9. Accessories make life better. Even when decorating your back porch, don't overlook the little details. I love this outdoor vignette by "Sullivan and Murphy". This styling makes the patio seem as cozy as a living room. 10. Dream big. Keep your eyes open for inspiration and ideas. Like "Town and Country Living" you might just find that one day your dream home will become a reality! If you were featured here, grab a Featured button. Be sure to like our Facebook pages, since we also post many other favorites there too. If you got featured on Facebook, then feel free to grab a featured button also. ideas, crafts, recipes, decor, and inspiring stories. Oh Wow! What great features! LOVE the mason jar light!! You always have amazing features! Thanks for hosting and letting us share! Christmas in July- "Frame Addiction"
Christmas in July- "Old World Christmas Decor"
Christmas in July- "Lattice Card Display"
Christmas in July- "Sharpie Plates"
Christmas in July- "French Script Cones"
Christmas in July- "Book Christmas Trees"
Christmas in July- "Instagram Spool Ornament"
Christmas in July-- Coming Soon!